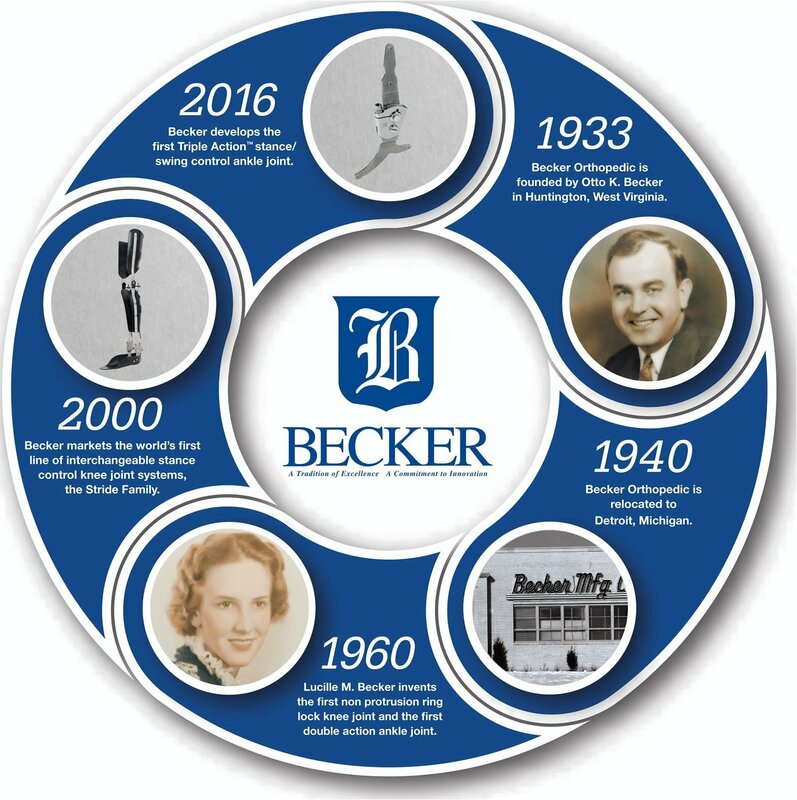 Becker Orthopedic was founded in 1933 by Otto K. Becker to provide high-quality orthotic components and central fabrication services. Today, Becker Orthopedic remains a family business dedicated to quality, service, and innovation in the field of orthotics. Becker Orthopedic is now ISO 13485:2016 MDSAP certified, which is applicable to our manufacturing, design, and servicing in our Central Fabrication Division. MDSAP is currently recognized by the Food and Drug Administration of the USA, Therapeutic Goods Administration of Australia, Brazil's Agência Nacional de Vigilância Sanitária, Health Canada, and Japan's Ministry of Health, Labour and Welfare, and the Japanese Pharmaceuticals and Medical Devices Agency. 1933 Otto K. Becker Company founded in Huntington, West Virginia. 2nd Patient Care Office opened in Detroit, Michigan. First Becker catalog with introduction of Central Fabrication services for lower limb and spinal braces. First name change to Becker Manufacturing Company and relocated all operations to Detroit, Michigan. Final name change to Becker Orthopedic Appliance Company and moved to Birmingham MI. Developed complete line of knee, hip, and ankle joints. Otto K. Becker passed away and Lucille M. Becker assumes Presidency. Rudolf B. Becker III assumes Presidency. Becker Metal Works, an investment casting company, was founded. Becker acquires Oregon Orthotic Systems.